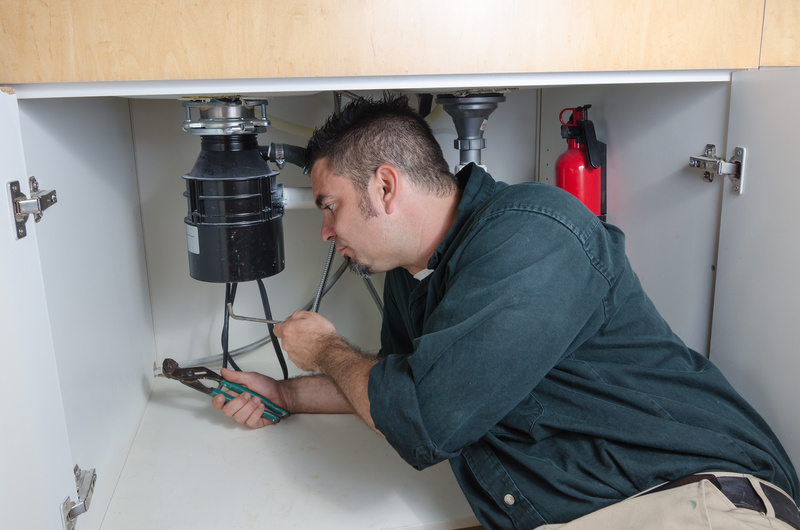 A plumber laying under a house hold sink working on a garbage disposal. Every modern kitchen boasts a garbage disposal system that converts kitchen waste into a semi-liquid form for easy disposal down the drainage pipes. The benefits of the garbage disposal system are numerous, chief of which is its undisputed advantage to the environment. There are several garbage disposal units in the market, and many of them are from the two most popular brands: InSinkErator and Waste King. If you are undecided about which brand to go for, this InSinkErator vs Waste King comparison article would clear every doubt and guide you into choosing the right garbage disposal system for your kitchen needs. When it comes to appearance, the InSinkErator brand of disposals have a modern and polished design that results in an overall professional look. The Waste King on the other hand looks clunky, huge and not-so-eye-appealing. However, it should be noted that for garbage disposals unit, appearances are not so important, since you are going to be placing the unit underneath your sink and inside the cabinet. In terms of construction, both garbage disposal systems are well-built and structured to last for a long time. However, the InSinkErator line must be commended for a stronger build. While the Waste King features several plastic parts including its mounting flange, InSinkErator garbage disposals boasts a durable metal mounting flange. Another piece of evidence of InSinkErator’s superior construction is the design of its splash guard: it facilitates optimal water flow through the unit. Not so for that of the Waste King units. Their splash guards inhibit fast water drainage, leading to criticisms from a decent amount of users. Both the InSinkErator and Waste King brands have entry-level models (usually the cheapest), mid-level models (averagely priced), and those at the higher end of the spectrum with an accompanying higher price tag. The InSinkErator has two major series: the classic Badger series and the more advanced Evolution series. The brand also has a separate disposal unit for homes with septic systems. The InSinkErator Badger series feature mostly its entry-level models. These units provide just the basic functions and nothing more. The Evolution models are the more desirable series of the InSinkErator, as they are more modern and offer extra features, improved functions and much needed upgrades. The Waste King on the other hand has a singular series known as Legend. The Legend line ranges from basic models to the high-end ones. The models in this series can be classified as either having an EZ Mount System or a 3 Bolt Mount System. Units having the EZ – Mount disposal system are notably easier to install and form the mid-level to high-end range of Waste King’s spectrum. Since these units are going to be placed underneath your sink, their size matters a lot. If the space beneath your sink is small, then an InSinkErator unit is usually the better option, as they are relatively smaller in size than the Waste King. However, smaller size equals reduced grinding space. Thus, while the Waste King is not suitable for a congested sink area, for those who have enough space beneath their sink, it is equipped with ample grinding space for your trash. Both garbage disposal systems are designed for continuous disposal. This simply means that more waste can be added for disposal even while the unit is running. The ability to efficiently grind the incoming waste into the smallest particle possible for easy drainage is the aim of any quality garbage disposal unit. For such reasons, the InSinkErator units are designed with three grinding stages to ensure no waste is large enough to clog the drainage system. Waste is grinded in the first stage and then filtered into the next stage for further grinding till all three grinding stages have been completed. This design can only be found on the Evolution series of the InSinkErator brand. The Waste King brand of disposals do not have this multiple grinding stage technology rather, they are designed with just a single stage. However, this does not in any way detract from the grinding performance of the units, as a large percentage of users attest to an effective grinding result with the single-stage Waste King disposals. The grinding chamber of disposal units are easily prone to corrosion thanks to moisture from the waste and the heat generated during the grinding process. Therefore, the grinding chambers of InSinkErator units are made from stainless steel so as to prevent them from corroding. The Waste King units also come with anti-corrosion grind chambers. However, while some of the models have stainless steel chambers, others are made with corrosion-proof glass-filled polyester. Both disposals boasts models with powerful motors, ranging from 1/3 hp to 1 hp. The higher the horsepower (hp), the more waste the unit is capable of handling on a regular basis. If two models having the same horsepower rating are compared, one from each brand, the Waste King unit is seen to operate at a higher RPM (Revolutions per Minute) than the InSinkErator counterpart. The entry-level models in both disposal systems are reputed to be very noisy when in use. The newer and more advanced models however are designed to be much quieter. It should be noted that the InSinkErator Evolution series are designed with a sound seal technology that makes them even quieter than the Waste King’s newer units. Waste King’s units usually come with a longer warranty period compared to the InSinkErator’s. Case in point, the highest warranty for InSinkErator is 7 years, while a high-end Waste King model can be equipped with a lifetime warranty. Depending on when you are ready to buy, you may find that the Waste King models generally costs less than InSinkErator units in the same class (similar features and performance) and still provides roughly the same quality and performance. Does this mean that the InSinkErator’s higher price tag is not worth the effort? Not at all. InSinkErator gives great results for its cost. But the Waste King also measures up quite nicely. You have extra cash? Go with the InSinkErator. On a smaller budget? The Waste King would not be a bad decision at all.